I have to call the landlord. Sigh. They keep patching the roof when they really need to put in a new roof. I’ve lived here 30 years almost, and it was really bad then. Now it’s to the point where I’m afraid one day my ceiling is going to cave in on top of me. 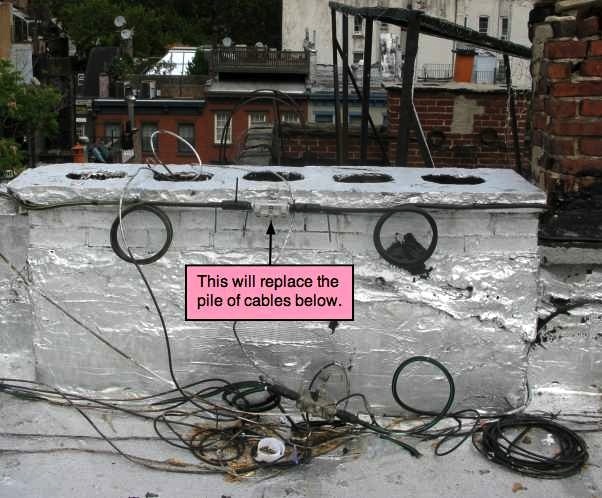 Time Warner Update: New cables run. They need to switch over to the new cables and splitters and taps and stuff, and also run a new line to my apartment. My tv is working in the meantime, hence my good mood. I’ll be posting about the new season in a week or two! Jeez, that sounds terrible about the leaking roof. I’m sure there are building codes and a building inspector there, and if I were you, I’d contact the inspector. There’s a similar problem next door to me; the roof of the house hasn’t been replaced in 30+ years, and after the tornado it was worse. The last rainy spell we had, the tenants said the ceiling started bulging with water, so they had to get out there in the pouring rain and put a tarp over it. There’s also a huge tree trunk on the utility room, directly over the gas water heater, very dangerous. I contacted the building inspector, and I know he came out there and told the landlord the tree trunk had to be removed. It’s still there nearly two months later. I’m going to the newspaper next, even if I have to write the article myself about this situation: rental property, cheap landlords is not only a problem here after the tornado, but in other cities that had tornado damage. Eventually the cities will have to address this issue, especially where dangerous conditions are concerned. Sorry, didn’t mean to write such a long diatribe, but since I had rental property in the past and always took care of it, cheap landlords make me furious! I live in a rent stabilized apartment, and for a long time I felt less anger towards the landlords because the income for the building was comparatively lower than other buildings in the city and particularly in this part of town. But now most of the apartment have been turned over and he’s getting market rent. He can fix the roof. Good luck with your repair quest! !